Interfaces is a passion of mine, which has lead to an extraordinary amount of time and brain juice dedicated to thinking about it. Over the years I’ve learnt a lot when it comes to composition, aesthetics and practical thinking. More importantly, I’ve learnt much about my own process of making UIs. There is a lot to it, and I hope that I can light the way for others by sharing my thought process and philosophy behind the creations of my interfaces. Hopefully, it can inspire you to make your own journey to creating your very own interface compositions. 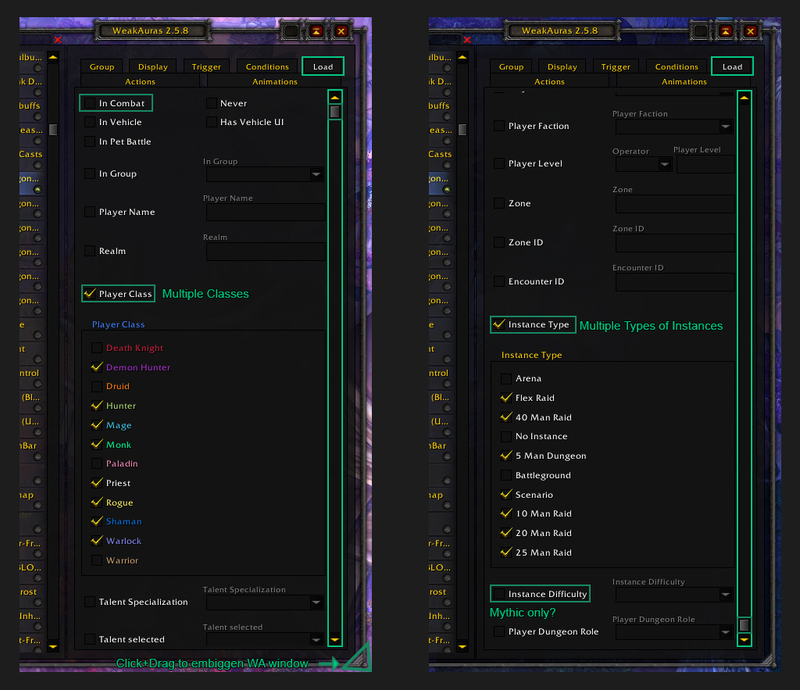 When it comes to creating and/or composing UIs, it’s very much a process of adding different pieces of the UI (an additional weakaura, or an addon, etc.) and testing to see if it works as it should/contribute any useful information. If a piece of weakaura or addon is redundant, then you need to prune it. This often makes you return to the process of adding another idea to experiment with, which circles back to pruning. And so it goes on! My main UI has been a never-ending process of adding and pruning, and I’ve loved every second of it. If you look at my UI over history, you’ll see that I’ve tried hundreds of different ideas. Most have been tested and pruned, but the best of the ideas have I kept in some form or other. Here’s an historical exhibit of my different UIs. As you can see, I go through many changes! I will also show you my current UI later in this guide as a main example of my current thinking about interfaces. The most critical aspect of creating a UI is location, location, location. You have different parts of your UI; the action bars, chat, player/target frame, your HUD, boss frames, proc auras, cooldown icons or bars, pop-ups and timers. When composing your UI, you’ll have to decide where the parts should be located and how much space they’re allowed to use up. Think of the area of your computer screen as your real estate. Different parts of your real estate is worth more or less. For example, close to the middle of your screen (the focal point of your character) is worth the most, while the outer edges are worth the least. Parts of your UI want to buy sections of your real estate. The currency is how much valuable information they can give you. In other words, only the weakauras or addons that can give you the most pertinent information is allowed into the holy ground that is the middle of your screen. Why is the middle worth most, while the edges worth least? It has to do with part what place on your screen your eyes stray most, and part where your screen needs to be as clean as possible. The middle of your screen and slightly above it is where your eyes should be, because that’s where your character is and you need to be attentive to where you stand in relation to the environment. In other words, you need to know if you’re standing in fire and it’s difficult to do that if the middle of the screen is crowded. On the other hand, your eyes are mostly focused on the middle of the screen. If an aura is close to the middle, chances are that you’ll notice it much more frequently, compared to if it’s out on the fringes of the screen. This means you need to strike a delicate balance between free space and interface elements. To show how I’ve done it myself, let’s break it down to its components. First here is the original UI. Now, keep in mind that I’m a healer and we inevitably have to have the big chunk of raid frames close to mid. 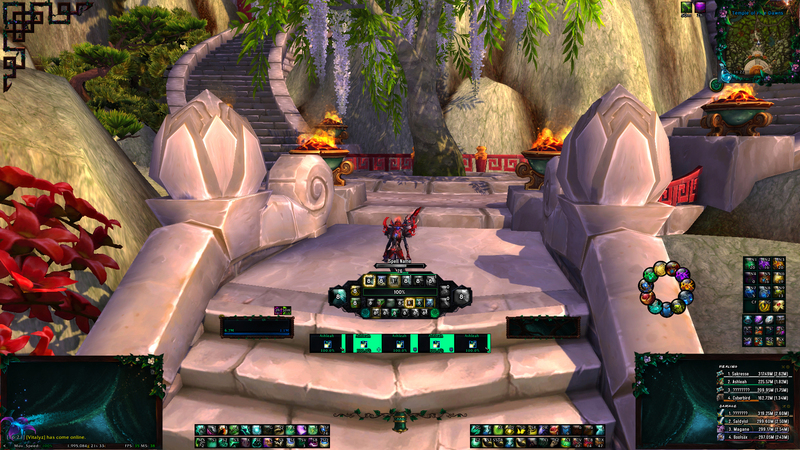 The raid frame pushes up the HUD a little bit too, so the mid is in fact a bit crowded (DPS have it easy, really). I would have made the HUD a bit smaller if I could, but it not only tracks cooldowns, but also buffs, power, health, trinkets, pots and cast frames of me and my target. I’ve squeezed a lot of essential things into a small space, and if I make it any smaller I’ll need a magnifying glass. The upside is that since I track everything I need in my HUD, I can skip action bars all together. But you can see that the important bits (HUD and unit frames) are much more closer to the focal point. The round weakaura boss frames I’ve made myself are slightly closer (they track boss health, power and casts) without crowding the middle. The rest is pushed to the side. This way I’m keeping track of the important information while the other elements are out of the way. When you create your own UI, you need to figure out what is important and what isn’t and place the different UI elements accordingly. Be careful with the space close to your character, and keep the frivolous to the edges. If I continue on the metaphor of your screen as your real estate, the interface would be the interior design. Here, the philosophy becomes more and more personal as we go. For example, some people like minimalistic style while others prefer more flourish. I am more on the flourish-side of the spectrum, with one exception. While progress raiding, I have to scale down on the UI. This has less to do with preference, and more to do with necessity. In progression raids, especially end-tier mythic, my UI has to compete with many encounter weakauras for space. And there are a lot of weakauras designed for each fight in the tier. That means that I have to radically change my UI for these occasions. Luckily, that can be easily done with weakauras! If you’re like me and a great part of your UI is comprised of weakauras, you can easily modify when and where it should appear. If you select a weakaura group you want to modify, jump to its ‘Load’ tab. Remember that if you click several times on a box, you can cycle through several options. There are loads of different ways on how to specify when and where a weakaura should show. I really recommend to browse and experiment in the Load tab, there is a lot to discover! You can also complement the Weakauras with different profiles in other addons. Most addons support having multiple profiles and you can customize each one to your preference. For example, an Elvui profile for raiding, one for dungeons, one for healing and or tanking, etc. There are endless way to tailor your UI for each occasion. Lastly, I also recommend getting a scrolling combat addon. That way you can chuck all those number into a small space of your choosing, rather than having them appear all over your screen! Think of yourself as an interior designer and balance the elements between aesthetics and practicality. You want a bit of both! This is a mock-up of my world exploring UI. It’s a RP-friendly UI for full immersion of the game. I sometimes show all my action bars (as opposed to having them on mouse-over) so I can rummage through all my utility potions and crazy toys. 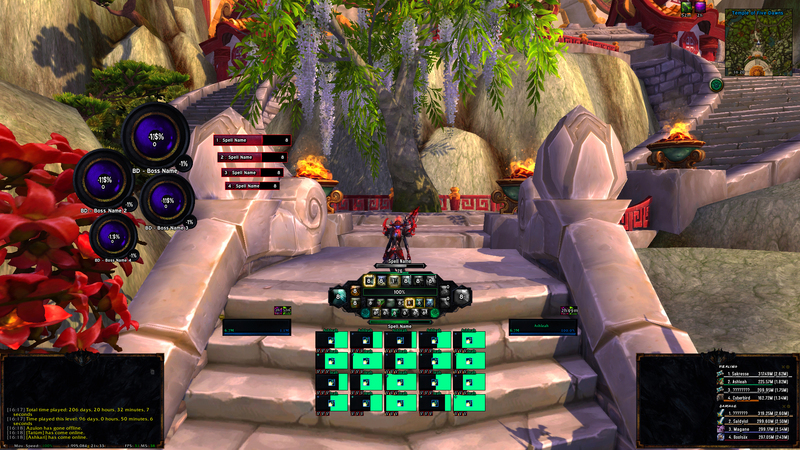 This UI is comprised of weakauras mostly, which I have set to only appear when in ‘No Instance’ in the load tab. Space is scarce and there is a lot of information to process at any given moment. Any unoccupied space needs to be reserved for combat data and information, or cleared up so I can observe the environment. It’s not a UI that pleases the eye exactly, but it’s functional which is its main objective when I’m raiding. Otherwise, I happily go back to my world exploring UI! There’s nothing so intimately personal as your HUD. That is, the group of weakauras (commonly) or other addon that gives you information on your rotation cooldowns, uptimes, buffs and resources. My HUD is where I’ve done the majority of my UI overhauls. It feels like I’ve gone through thousand of iterations. Each one had something I liked, but it also sported a glaring flaw that bugged me to no end. The reason to why I’ve had to go through so many iterations is mostly because I’ve based my own HUD on other’s design. As I said earlier, HUDs are very personal. If I base my design on someone else’s, the process is pretty much like a kid trying to fit a square block into a round hole in the shape sorter toy box. It doesn’t work, unless you open the box and place the block in there when the adults aren’t watching. And that’s just cheating with none of the satisfaction. Right? Right. Big Cooldowns: Almost every class has at least two big cooldowns that aren’t talents. For Mistweavers, these are Revival and Life Cocoon. Rotational CDs: The main cooldowns (usually small cds) and buffs you need for the spec rotation. Power (Mana): Tracks power, mana, in case of my Mistweaver. It changes color depending on value! Talents: This row shows all my talents and adjust itself automatically if I change them. If a talent is passive, it’s semi-transparent so it doesn’t compete for attention. Utility: The utility bar is basically everything that’s left out in the spell book. Movement increases, taunts, defensives, dispels, etc. Trinkets: This two icons does not actually track the trinkets per se, rather they track the trinket slots. This means that it dynamically updates itself when I change trinkets. It also blinks if the trinket is currently usable and then shows the duration of its cooldown. Potions: These show health and power/mana potions. As for the health pot, it first tracks healthstones, and if you don’t have any it shows Astral Healing Potions, and if you don’t have any of those either it shows Ancient Healing Potions. The aura basically rummages through your bags to see what you have and shows that. Proc Orbs: Alerts me about buffs that have procced by popping up color. In case of my Mistweaver, it’s Concordance and Mists of Sheilun. Cast Bar: Shows my casts. Target Cast Bar: Pops up when my current target is casting something. I find it very helpful to have it centered since I often miss it otherwise and am perpetually unprepared for incoming damage. It helps that all my spell casting is on mouse-over so I can keep enemy targets selected at all times. Thin Bars: The upper one shows GCD and the lower one (below mana) shows health. I used to have a much scarcer HUD, but then I always found myself checking my action bars for information. Now I can hide my action bars without being in any danger of missing out on anything crucial! Another problem this version of my HUD has solved, that I struggled with earlier, is talents. Depending on what talent set up I have, there are different amounts of active abilities versus passive ones. If I went from one set up with a lot of active abilities to one with many passives, it usually wrecked havoc on the whole structure. Now they’re all neatly designated to the same row and can’t disrupt any of the other auras. The passive talents are faded while the important ones are either blinking or glowing when they’r ready to use. Does this mean that my HUD has universal appeal? Likely not. As stated again and again: HUDs are very personal. My HUD works perfectly for me, but it might work very poorly for someone else, and vice versa! When working on your own HUD, it’s fine to base it on someone else’s design as a start, but it’s better if you further customize it to suit your personal needs. I’ve tried several versions to figure out what I needed, and it has really become tailored to fit me perfectly. It took a lot of work, but it was all worth it! I hope these insights into my thought process will inspire you to experiment with your own interface. We all might end up with different types of interfaces, but that’s the beauty of it!